First there’s nothing, then an entire forest. A mountain range emerges in three strokes: a rough, black triangle; a deposit of fresh snow settling over a broken, rocky cliff face; and finally a long, blue shadow across the lee side. Barren tree trunks are placed in a succession of downward stripes before a series of small swipes fill them out with thick evergreen branches. It’s so immediate that its creation feels more like brushing away the dust obscuring an image hidden underneath. There’s no preliminary planning, no blocking out of shapes or composition. 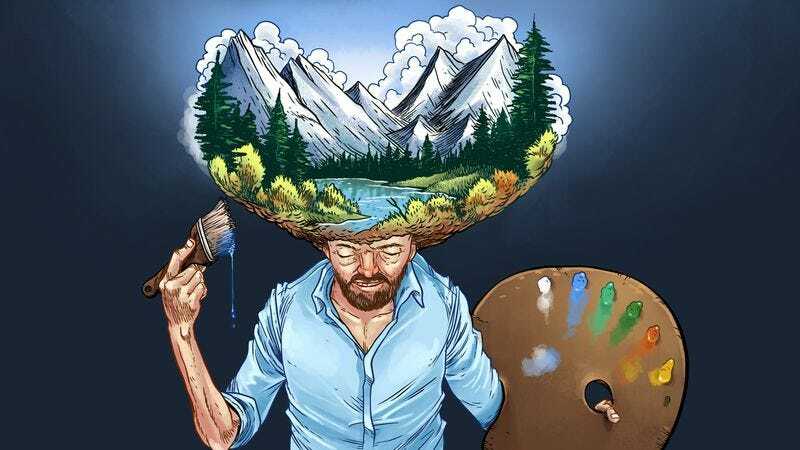 It’s a hypnotizing illusion Bob Ross delivered for 11 years on his show, The Joy Of Painting, which lasted from 1983 until a year before his death in 1995. Netflix recently added 25 episodes of the show to its streaming catalog (under the name Beauty Is Everywhere), demonstrating how compelling the artist remains and how entrenched he is in our cultural consciousness. Bob Ross is often referred to as “The Mr. Rogers Of Painting” due to his kind persona and gentle insistence that painting is something everyone can participate in. Ross himself didn’t learn until after a 20-year career in the Air Force, a skill he developed, in part, as a means to quit the military so that he wouldn’t have to yell anymore. That’s the sort of anecdote that fuels the Ross mythology—that of a fundamentally kind man. The only public record of any tumult in Ross’ life is in his relationship with the man who taught him to paint, William Alexander. Alexander, who had his own PBS show, The Magic Of Oil Painting, claimed to be the originator of wet-on-wet oil painting, the technique Ross used on Joy Of Painting. Classical oil painting is a time-consuming process of building up slow-drying glazes to produce a luminescent effect. If a layer is insufficiently dry, colors blend and become muddy. The wet-on-wet technique speeds this process up considerably by controlling the mixing of colors on the canvas so highlights and shadows are created with a quick series of gestures. Once mastered, it becomes easy to whip out a competent, representational image in a very short amount of time. Alexander never got over what he felt was Ross’ theft. Without speaking to whether Ross unfairly took credit, it’s fair to say that it’s not the method of paint application that caused Ross to surpass his former mentor in popularity. Watching Alexander highlights just how much Ross’ personality benefits his show. Not simply with his widely quoted peacenik platitudes (as endearing as those are) but also in the rhythm he folds into his tutorials. Ross maintains a smooth, unbroken cadence as he shifts between instructions on brush placement or color mixture to a completely unrelated observation about the epileptic squirrel he’s rehabilitating. Each comment punctuated by the rhythmic pat of the brush or scraping of the palette knife against the canvas becomes almost musical. Ross’ teacher didn’t have nearly the same on-camera ease. He spoke distractedly in a thick German accent and contemplated how artists suffering from a surplus of imagination led to acts like Van Gogh slicing off his own ear. A host who muses on self-mutilation in a brusque Teutonic inflection just won’t find the same level of enthusiasm among public television viewers as the softcore hippiedom of Bob Ross. Strangely, what also inhibited Alexander’s popularity is that he was the better, more adventurous painter of the two. He used a more sophisticated selection of brushes and approached a variety of subject matters. Ross stated in the first episode of Joy Of Painting that he would use an identical color palette and tools for every episode. This was so that a novice, no matter how new to the show, could start painting along at any point in the series. But it served another purpose of creating a pleasantly homogenized experience. Every episode produced essentially the same painting. It’s comforting and reliable, like a franchise burger prepared the same regardless of where you are. The thematic and technical focus also helped to mask flaws. The more Joy Of Painting you watch, the more it becomes evident that Ross isn’t a particularly technically proficient painter. By his own admission, he had limited range. His landscapes never depict fauna or any man-made structures other than an always identical rustic shack—slightly off perspective and proportioned indifferently to the rest of the painting. Some of these qualities are attributable to the speed with which Ross paints; completing an oil painting in 30 minutes is no small feat. But even in his work created outside of the show, Ross never deviated from the formula he used on camera. There are two central components to the Ross formula, his tools and his compositions. The majority of his paintings were done entirely with four instruments: a two-inch natural bristle brush, a palette knife, a fan brush, and a small filbert brush. The palette knife was his primary tool and the secret to producing work so quickly. It’s used primarily to sculpt hard-edged forms like rocks, cliff faces, and waterfalls. By mixing together paint, but not blending them to a uniform color, a single stroke applied against a dark background produces a highlight, mid tone, and shadow in one swipe. The glob of paint will break up on application, creating a visual texture that approximates a rocky surface. It’s an easy method of producing shapes with volume. The trick is to do it quickly and at the proper angle. If the paint is applied incorrectly or worked over too much, everything will blend to a flat, gray smear. The technique more closely resembles calligraphy than painting, and each stroke displays the muscle memory of countless penmanship lessons. The two-inch brush is a standard utility brush, the kind of big, flat-edged tool more often associated with house painting than creating art. It’s used to blend large areas of colors together, feathering and softening the paint to create a smooth color transition. Skies are treated almost like watercolors, using thin, light tones. On top of a simple foundation, another pass is made with a thicker application of oils in wide circles. This produces Ross’ signature happy little clouds. Almost all the foliage—bushes, tree cover, and plants—is also done with the brush, but by using a very different method. All the pigment is concentrated along the edge. And as with the palette knife, the colors are blended unevenly, the first dabs are bright and intense, popping against the dark background. Each consecutive dab downward delivers less and less color, making the foliage appear to fade into the background. The fan brush and the filbert brush, so named because the head resembles a hazelnut, are used to a much more limited degree. The wide, flat bristles of the fan brush are best for creating evergreen trees and sometimes the white edging along the shore of a pool of water. The filbert brush is used almost solely with paint thinned down to ink consistency to render long, thin tree trunks that are often obscured beneath layers of leafy brushstrokes. Ross adheres to a nearly identical template for his painting compositions as well. While there are exceptions, each picture is painted in three stages: a high background, a low middle ground, and a foreground. Seen enough times, his work comes to resemble a pop-up book, with each visual plane as cleanly delineated as if it were its own sheet of paper. The subjects usually consist of classic Romantic landscapes: mountain ranges and great old forests or pastoral, rolling plains. The background will be high and slightly offset. Unless the painting is a winter scene, the central plane almost always depicts a body of water—a still, reflective lake or a meandering stream that culminates in a series of stepped waterfalls spilling over each other. The foreground will have one or two trees or tufts of plant life to act as a frame closing in the composition of the landscape. There are never experiments with perspective or viewing angles. Every painting is a scene viewed from average human height looking directly toward the horizon. There is an undeniable tourist-town street painter quality to Ross’ work, a huckster’s emphasis on the novelty of how to speedily produce a recognizable product. Ross’ paintings adhere to the proper rules of color and shape composition but don’t profess to explore anything deeper than an approachable, pretty painting. His personality of nonaggressive positivity provided the key element that elevated work that could otherwise be tawdry kitsch into something emotionally honest. History is full of stories about the volatile assholes who made transcendent art. Bob Ross demonstrated something more unique; how art, regardless of quality, can help you be a better person. In a rare instance where Ross deviated from inland mega-flora to paint a seascape, he introduced the episode with a story about spending the day sailing with a friend along the Florida coast. They caught a fish, but Ross quickly pointed out, “And you know me, friends, we just had him in the boat long enough to take a few pictures, then we wished him well and threw that fish right back into the ocean to be with his family.” And he’s right. We do feel like we know him.